<b><b>Mr. Lemoncello is going live with a brand-new televised BREAKOUT game! Discover what James Patterson calls "the coolest library in the world" in the fourth puzzle-packed adventure in Chris Grabenstein's </b><b><i>New York Times</i></b><b> bestselling MR. LEMONCELLO series!</b></b><br><br>Greetings, boys and girls, gamers of all ages--are you ready to play Mr. Lemoncello's BIGGEST, most dazzling game yet? After months of anticipation, Mr. Lemoncello is taking his games out of the library and going LIVE across the nation on the world-famous Kidzapalooza Television Network! Everyone's invited to audition, but only a lucky few will be chosen to compete in front of millions of viewers in a brand-new, completely immersive live-action breakout game--with real kids as the playing pieces! 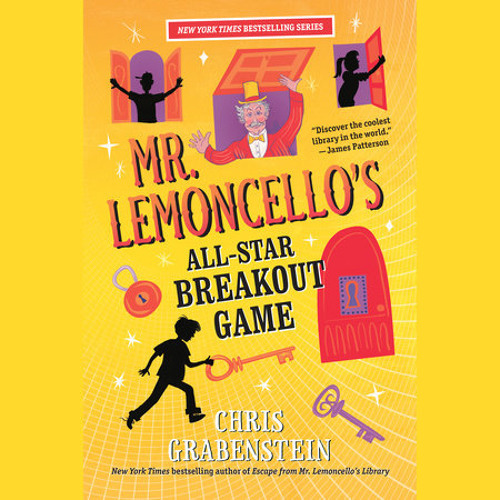 Kyle Keeley is determined to be one of them.<br><br>Each of the winning teams must make it through five different rooms in Mr. Lemoncello's fantastic new Fictionasium by solving a puzzle to unlock each room and, in the end, break out of the library! But nothing is ever as it seems with Mr. Lemoncello, and the surprises in store just might stump even the game master himself. Can Kyle break out of his own expectations--and win Mr. Lemoncello's ultimate game show?